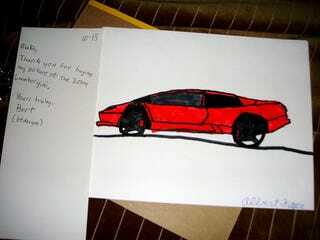 Remember that very cute Lamborghini doodle a kid was selling on Etsy a month ago? It went to a Jalopnik reader who was kind enough to share the booty with us. Top speed? 300 MPH! As photographed by our reader Blake Egan, the young artist is a bit optimistic when it comes to the top speed of Sant’Agata Bolognese’s finest. But pay no mind. You’re about as likely to travel at 300 MPH as at 200. The devil is in the artistic details. “The kid's specs were a bit off, but the wheel details were pretty stellar,” Blake writes and pretty stellar they are indeed.